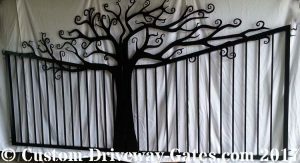 Tree gates Archives - Custom Driveway Gates - Iron Steel & Aluminum - JDR Metal Art - FREE Standard Shipping! 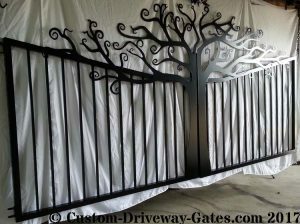 Here’s one of our recently built custom aluminum driveway gates. 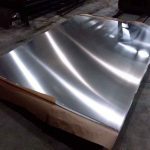 It was handcrafted from lightweight, corrosion-resistant aluminum sheet metal and square tubing and super heavy duty hinges. 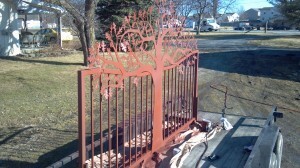 As it’s a dual swing gate, each gate panel is 7 feet wide in order to span a 14 foot wide driveway. 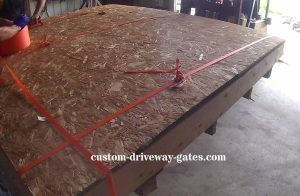 Each gate panel is also approximately 7 foot tall where the gates meet in the middle. 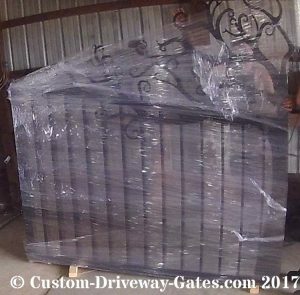 This particular gate was delivered to a customer in Athens, Georgia. 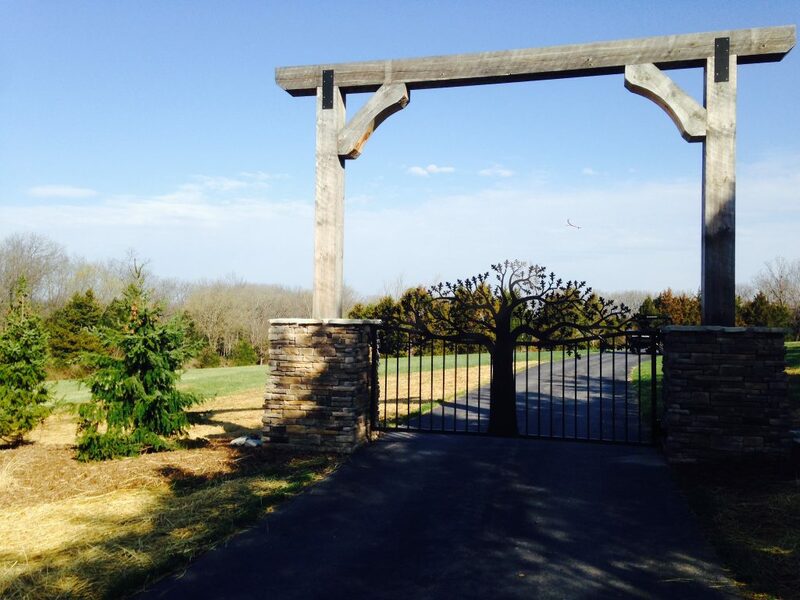 We also recently installed similar aluminum driveway gates in Louisville, Kentucky. This St. Louis project that we are currently working on at JDR Metal Art is going to be a wrought iron oak tree driveway gate that will be mounted between two stone columns. We have coordinated measurements with the property owner to make sure the gate will fit well at its final destination. 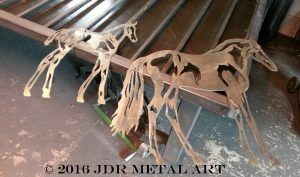 This 5×12′ plate of 3/16″ thick steel has been traced with the outline that we will be using to make the tree. The trunk will be extended by splicing it to the rest of the tree with another piece of plate cut from the leftover material. After a few hours of cutting..close to the halfway point with the tree. 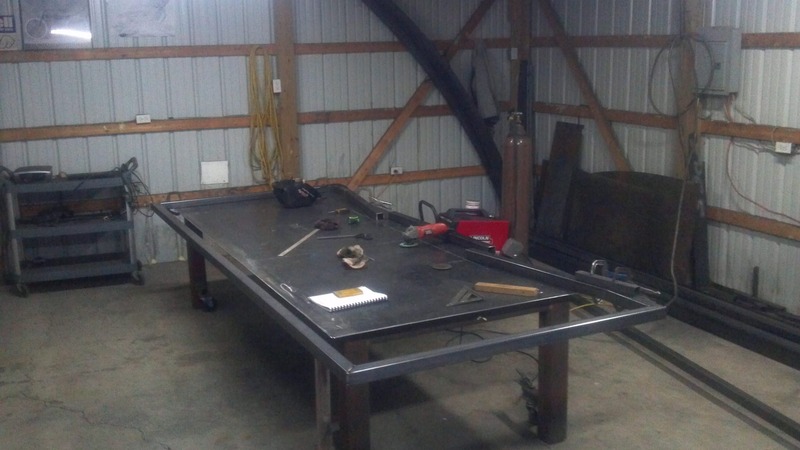 Fitting the outside frame together on the fabricating table. Each end of the gate needs to be 4’6″ tall so as to stay below the capstone on the column…while the center slopes down to 4’0″ tall. 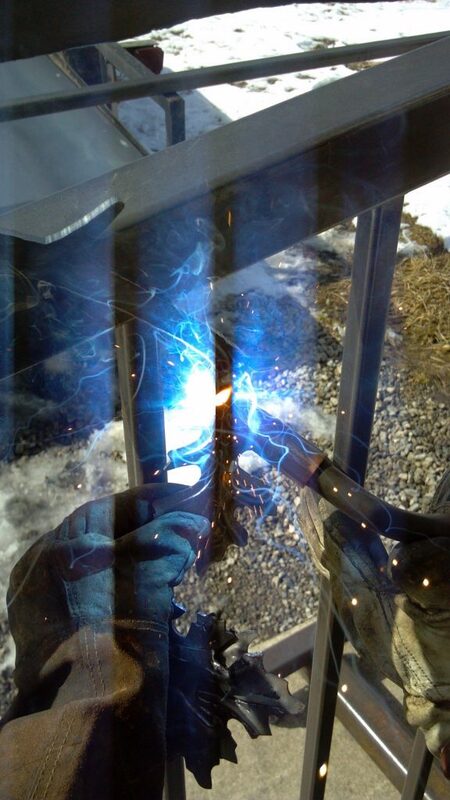 Sparks fly as a MIG welder is used to superheat the metals for joining. 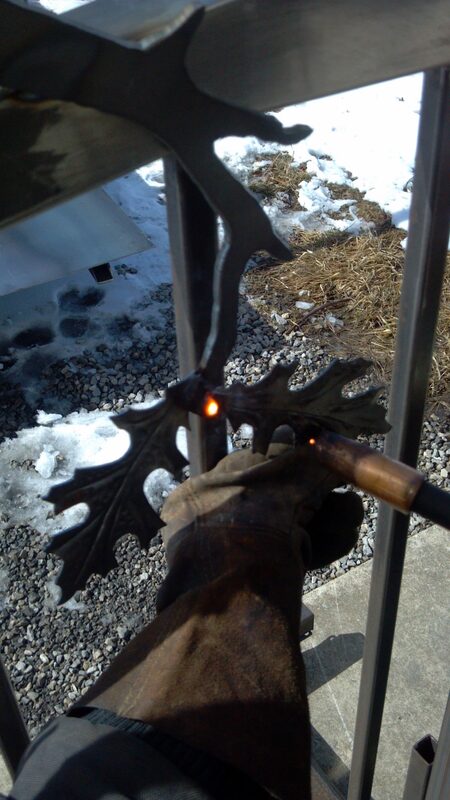 The leafs become permanently attached to the branches of the tree by using this tool much like a hot glue gun. 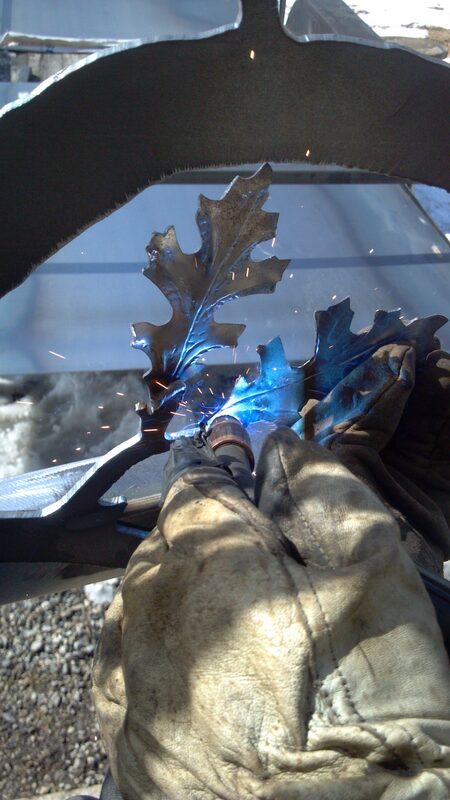 Cloud of welding fumes lit up by the blue welding arc (above) while the picture below shows the cooling molten metal on a steel leaf after it has just been joined to a branch. 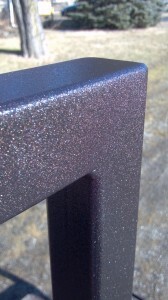 A coat of red primer helps the finish coat adhere better to the gate. 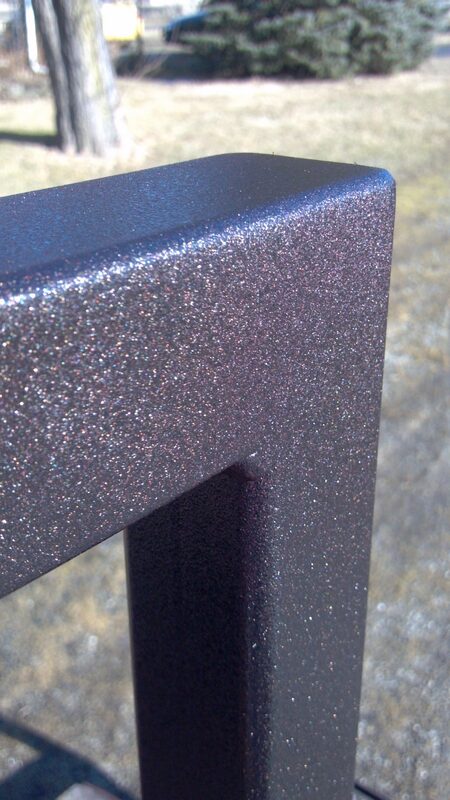 The topcoat is an oil rubbed bronze paint from Rustoleum. The leaves are quite detailed and authentic looking. 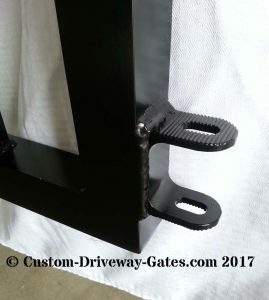 We have worked with numerous clients from the St. Louis, Missouri area and provided them with personalized entry gates for their driveway entrances. 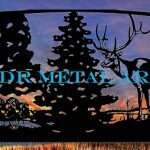 Not only do we design wrought iron tree gates, we also specialize in designs featuring wildlife, equine and much more! 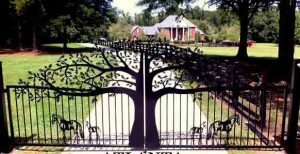 You can learn more about our custom gate design process if you are interested in having us help you create a one-of-a-kind gate that you will be sure to enjoy for many years to come.